The Dalmatian is a medium-sized dog that is affectionate, very athletic, highly intelligent, and has plenty of energy. This breed is extremely driven, loyal, and well-suited for work or companionship. The Dalmatian is known for its distinct spots, its history as a firehouse dog, and, of course, its acclaim from the Disney cartoon movie. The Dalmatian's true origins are up for debate, but evidence of similar types of dogs goes back to ancient times. It is likely that the breed did not actually originate in Dalmatia (present-day Croatia), but it is certain that Dalmatians were once used as sentinels in the area. They appear in artwork from the early 1600s. The Dalmatian is known for its affinity with horses, which made it the original and prized carriage dog or coach dog in England. They would run alongside carriages to serve as protectors and status symbols. Then they also guarded the stables at night. The breed has also served as a dog of war, guard dog, retriever, ratter, and shepherd. The first Dalmatian club was established in England in 1890. The breed was recognized by the American Kennel Club in 1888. The Dalmatian arrived in the U.S. around the turn of the 20th century and one worked closely with teams of firefighters, starting from the era when horses were still used to pull fire engines. The breed is often still seen as a firehouse mascot. Anheuser-Busch also includes a Dalmatian as part of its teams of Clydesdale horses. Dalmatians were made extremely popular by Disney's "101 Dalmatians" films and programs. This had an unfortunate side effect of irresponsible breeding and inappropriate adoption. 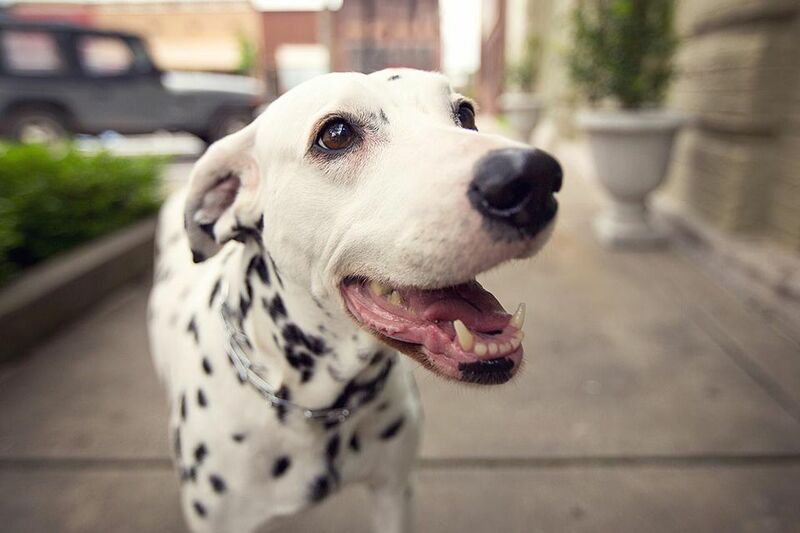 As many people could not handle a high-energy Dalmatian, many were abandoned, and rescue organizations were developed. The fad faded and AKC registrations dropped 90 percent in the 10-year period after 2000. The Dalmatian has a smooth white coat with distinct black or brown spots. Puppies are born white without spots, which develop later. This breed requires little more than basic grooming but is a relatively high shedder and sheds year-round. Regular brushing will help minimize shedding. The good news is that their coat seems to be dirt-repellent and will quickly shed any mud or other debris. Be sure to clean the Dalmatian's ears regularly to prevent ear infections. In addition, keep the nails neatly trimmed so your Dalmatian can walk around comfortably and safely. Dalmatians are very agile, athletic, and versatile. In order to keep this dog in good shape (physical and mental), Dalmatians need tons of exercise and plenty of activities. Otherwise, they are prone to weight gain, anxiety, and even behavior problems. This breed may also have a tendency for excessive barking, especially if there is not a proper outlet for the dog's energy. Be sure you walk a Dalmatian on a leash and have a secure enclosure. When off leash, they may bolt and be long gone before you can react. The Dalmatian is known for its ready-and-willing attitude and seemingly endless energy. These dogs are quite smart, despite what some may think. The extreme energy level of the Dalmatian makes the breed appear goofy at times. This is why proper training is absolutely essential for this dog. The Dalmatian is typically very clever and eager to learn if you are diligent and can keep its attention. Disney's "101 Dalmatians" may have made the breed popular for families with children, but, ironically, the breed is not naturally compatible with smaller kids. The high-energy dog can knock over small children and get overly excited in play. Although with proper training and socialization, even this can be overcome. Dalmatians can make excellent companions for the right household. It is most important that everyone in the home understands the Dalmatian's need for activity and training, so active households are ideal. This is an affectionate dog breed that bonds closely with its human companions and can make a lovely companion for the active individual or family. Deafness: About 10 to 12 percent of Dalmatians are born deaf and 22 to 24 percent have hearing only in one ear. This is an inheritable condition and these dogs should not be bred, but they can lead full and well-adjusted lives. Hip Dysplasia: This is an inherited condition that can produce lameness and arthritis. Urinary Issues (infections, stones): This is more of a problem with Dalmatians than with any other breed as they excrete more uric acid in their urine. They need plenty of water and food that is not high in purines. All pure-bred Dalmatians will have this tendency and there are breeding projects underway to reintroduce normal genes. Skin Allergies: Dalmatians may have food-based allergies, contact allergies, or inhalant allergies. A Dalmatian will need two meals per day for a total of 1.5 to 2 cups of dry food. You may need to get a special dog food that is low in purines so as to reduce the risk of kidney stones. If you notice your dog is gaining weight, discuss the proper feeding schedule, food amount, type of food, and exercise with your veterinarian. Be sure to provide constant access to water to reduce the risk of stones. It is good to note whether your dog is urinating regularly. Do you think this is the dog for you? If you would like to get your own Dalmatian, take the time to do your research first. Talk to your veterinarian, other Dalmatian owners, reputable breeders, and rescue groups to learn more.